Source: Wild Well Control, Inc.
Wild Well Control has the firefighting and emergency response expertise to respond to oil and gas or marine incidents worldwide. Wild Well Control has the firefighting and emergency response expertise to respond to oil and gas or marine incidents worldwide. When an incident occurs, a Wild Well Control First Responder will make initial contact with the client, assess the situation and then develop an action plan. The action plan will include the resources and equipment needs for the incident. The action plan will be reviewed with the client, and once approved, will be activated. A well control event is any level of incident where the integrity of he wellbore or operations (drilling/workover/remedial) is in jeopardy. 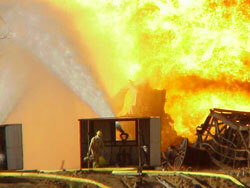 The event could be a pressure control situation or as catastrophic as a blowout with or without fire. Wild Well Control has capped hundreds of wells on land, in inland waters and offshore. In addition to conventional capping operations, Wild Well Control has performed the following specialized capping operations. Utilize Coiled Tubing to re-enter wellbore of flowing/burning well and set packer. Our understanding of both surface and downhole conditions enables our team to work closely with operators to solve complex well control problems, develop operational design parameters and troubleshoot drilling and production issues.